What is twirl curling? It’s a styling technique which provides ringlet style definition. If you have curly hair how to do twirl curling to create ringlets is a topic you likely will benefit from. Some people call this skip curling instead of twirling, but whether you want to call the technique twirling or skip curling, it’s the same basic technique. For this curl creating technique, use a curl enhancing cream and a wide tooth comb. 1. Cleanse your hair in lukewarm water with your favorite product for your hair type, texture, condition and length. Use your desired cleansing method such as full strength shampoo, low poo, diluted shampoo (DS), conditioner only (CO), no poo, water only (WO). 2. Rinse shampoo well and then gently squeeze out excess water with fingers in an accordion method. 3. Apply rinse out conditioner from the top of the ears down to the ends. 4. Use a wide tooth comb or your fingers and detangle from the ends up to the roots. Work in sections and work slowly. 5. Towel blot to remove excess water. 6. Apply your desired styling cocktail include leave-in conditioner, defrisant or similar. 1. Take a section of hair ranging from 1/2″-3″ in diameter. The larger the section of hair, the looser the finished curl. The smaller, the tighter. 2. Apply a curl enhancing cream. Use comb (or fingers) to distribute cream throughout strand. There comes a time in every girl’s life where she wants ringlets. Of course it’s necessary to have hair which is shoulder length or longer in order to create the ringlets. If you have human hair extensions or extensions which are heat resistant you can also create ringlets. Ringlets often are easiest to create on hair which has natural bend, curl, wave or similar texture. If hair is bone straight naturally it’s still possible to create ringlets with some work and styling. Known also as spiral curls, this look can be so much fun to showcase for the right occasion. Obviously the hairstyle might not work for someone in their 60s, 70s or 80s but you never know these days. Also, if you want to avoid all the work to create spiral or ringlets on your own hair, take the easy way and check out the Kathy Ireland spiral curled wigs. Step 1: Start by detangling your hair from the ends to the roots with your fingers, a 100% boar bristle brush or a wide tooth comb. 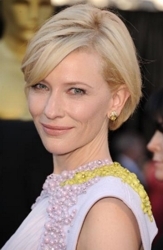 Actress Cate Blanchett is famous for being unpredictable and a true hair rebel. She’s worked with some of the best celebrity hairstylists in the work including Danilo and Mark Townsend who enjoy working with the trend setter. She will constantly surprise on the red carpet going with an elaborate updo or simply tousled bedhead hair. With Cate you just never know what her hair mood will be. Indeed Blanchett has been a redhead, brunette and blonde at various times in her esteemed acting career. If you want to copy Cate’s latest platinum blonde short choppy hairstyle ask your stylist for an asymmetrical and wispy short hair cut. This haircut can be modified to work with most face shapes, hair types and even natural textures. As reported by JustJared.com, Easy A red haired actress Emma Stone was spotted Sunday, March13th in Los Angeles walking around the set of her new drama, The Help, with a head full of bouncy light blonde ringlets and curls. Some on-set hairstylist was obviously busy with a curly iron. The 22-year-old actress plays Eugenia “Skeeter” Phelan in The Help, which centers around three women living in the South. The three form an unlikely but deep friendship. The actress is back in the States after spending time in France for Paris Fashion Week. Emma sat in the front row for the Louis Vuitton Ready to Wear show, which actor Alex Pettyfer also attended. Their appearance together generated buzz that the two may be dating now that Pettyfer has parted ways with Glee’s beautiful blonde Dianna Agron. They seemed very cozy and flirtatious at the Vuitton show which created speculation that Pettyfer is over Agron. The actress, who is also set to appear as Mary Jane in Spiderman, rested her arm against his shoulder as they hung out together. At least now we know why the gorgeous redhead went with a very blonde hue. It’s for her part as Skeeter. Also, the curls she was spotted with on set were created for her because her natural hair appears to be relatively straight with just a hint of wave. Personally I like her best as a redhead, but as an actress she has to take on all types of hairstyles, colors and cuts for her craft. Lauren Alaina is blonde and beautiful with an amazing voice. The 16 year old Top 13 American Idol contestant has long, lush, wavelicious tresses. Lauren rocks a big pop of white blonde color merged into her chocolate brown base. Her luscious tresses have already transformed just in the few weeks the teen-ager has been on AI. Recently Lauren showcased beautiful volume and texture on the American Idol stage. 1. Cleanse hair in lukewarm water according to your favorite method such as Diluted Shampoo (DS), Conditioner Only (CO), Low Poo (LoPoo) or Water Only. Select a product which is best for your hair type, texture and current condition. 2. Rinse with lukewarm water and gently squeeze excess water out with your fingers. 3. Apply a rinse-out conditioner from the top of your ears down to your ends. 4. Detangle strands with your fingers or a hair-friendly smooth wide-tooth comb. Work from the ends up to the roots. 5. Rinse conditioner from hair and finish with a cool/cold rinse. 6. Towel blot to remove excess water from strands.